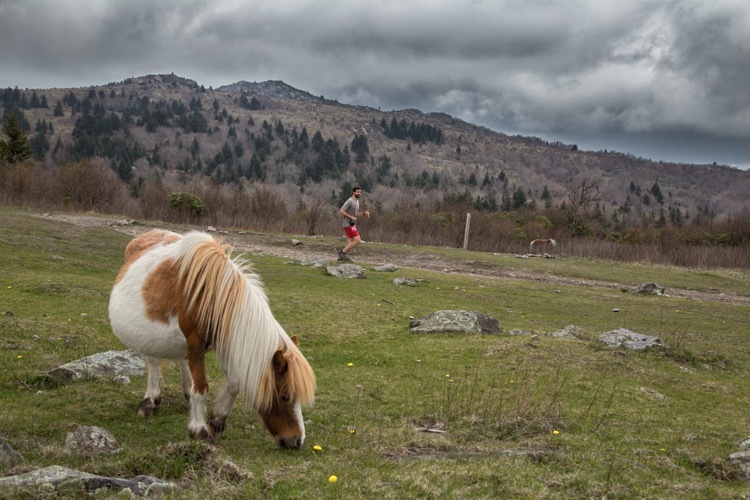 Is there such a thing as a trail race that meanders along babbling brooks and waterfalls, through rhododendron tunnels and into the expansive heights of the highest points in Virginia where ponies roam? 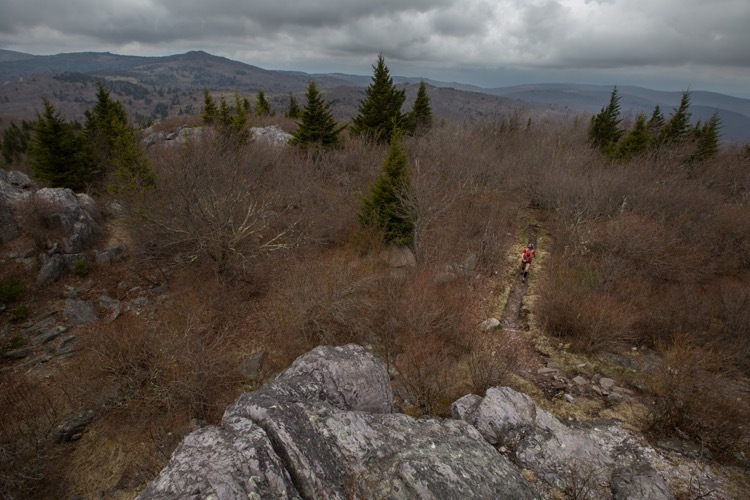 You bet ya – the Grayson Highlands 50K! 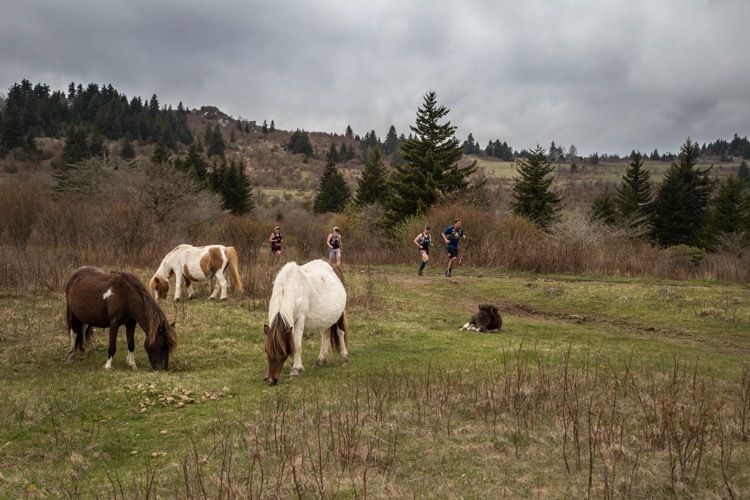 I set off to sleep the night before the race with ponies prancing in my dreams and awoke the next morning, much to my surprise, to a very nice morning – what a treat! After arriving at the park and picking up my bib, racers began to mingle awaiting the mandatory 7:45 a.m. meeting, when we were called to the start area by the Co-RD a little after 8 a.m. (the official start time). Turns out the RD, Sean ‘the Run Bum’ Blanton, had dashed out just 45 minutes before race time to re-mark the re-marked course. Due to the forecasted thunderstorms all week, the RDs had re-marked the course to lower elevations the day before the race, only to awaken race day to partly sunny skies! 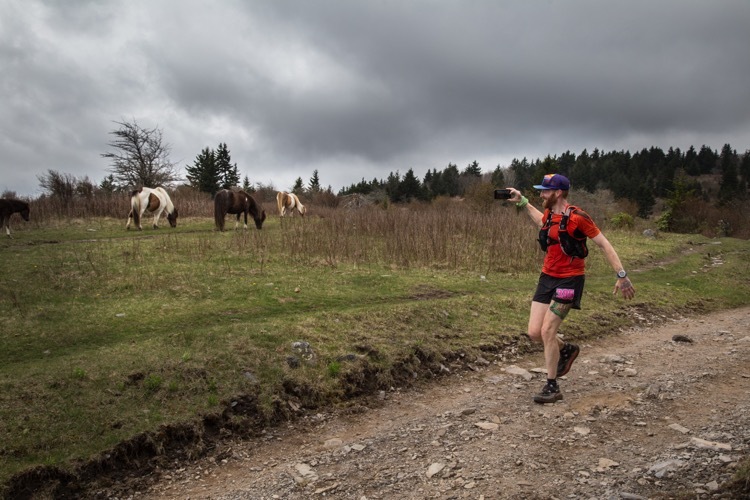 Sean wanted the racers to experience the original course that traversed the higher grounds, passing through pony territory and the majestic views. Everyone was so grateful that Sean went through that extra last-minute effort – it was very much appreciated. The call to start was shouted and the pack took off! There was so much energy as we sped downhill along the paved road for about a mile before hitting the single track that took us winding into the woods, along a stream, and the first sighting of a waterfall. After emerging from this wooded area, the landscape opened up and we began our ascent toward the ponies and those majestic views. Making it up that climb was well worth it as at about mile six, we began a long rocky, rubbly descent down into Aid 1. It was a fun challenge navigating the technical terrain. I kept on trucking through mile 13 or so as we made another slow ascent and I looked forward to seeing my husband who was waiting for me at the mile 17 aid station – motivation to keep up the pace and to keep pushing. I entered the aid station to cheers and welcoming, helpful volunteers who wasted no time to help with anything I needed. I quickly took off down the double-track road to the rumble of thunder, but thankfully never encountered more than a few sprinkles during the race. The course next took us through mile 18 onto amazingly beautiful single track. It was like a mini roller coaster throwing us up and down and twisting around through a rhododendron tunnel that paralleled a creek with gushing waterfalls. I needed to take caution following course flags in this area because several people thought the course must traverse through that river – alas, it was for viewing purposes only, and onward we went. The next couple of miles to the out and back 21.5-mile aid station was admittedly a bit of a slow slog along double track. Fatigue and sore legs soon overshadowed my elated high coming off the open mountain and through the rhododendron tunnel. However, it was fun to see the top runners returning from the aid station; most of them were quite friendly and tossed out encouraging words as they zoomed by me. Then came the seemingly endless climb of 1,300 feet over the next 2.5 miles. GASSED. SPENT. ZIP. ZERO. ZILCH. However you want to put it, my tank was empty. A friendly woman soon accompanied me and we chatted for several steps before her strong fast-paced hike overtook my slow slog – I was impressed! After she jaunted by and quickly made her way up the trail, I dug deep to just keep moving and get to the top of this climb. The final aid station was up at the Visitor Center and right next to the finish, so it was filled with people cheering, including my husband, and friends who were helping with timing at the finish. I came around a bend in the trail and reached a high open rocky point – “Only 1/4 mile until the finish!” someone yelled as racers approached. I gave a good ‘ol thumbs up and a smile (for the camera of course! ), and as I came down off that rocky peak, I heard cheering and clapping and saw the flat gravel path that I knew would lead me to the sweet finish line and a high five from the RD. I highly recommend this race. It is technical and challenging, yet achievable for various abilities. We lucked out on the weather and got the spectacular views and adorable pony sightings (babies too!) that we were promised by Sean. Definitely make this a bucket list race!